Many spiritual traditions of the world overlap in their teaching and, thus, have similar imagery. Different names are used according to the language of the culture. Different genders might also be used or different qualities emphasized,yet the Beingness and the inner qualities of Presence being conveyed are basically the same. For example, Venus and Kwan Yin. 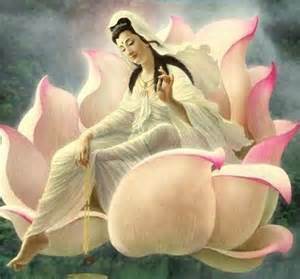 Venus was born from a shell on the sea and Kwan Yin is often depicted emerging from a lotus which blossom as it emerges from the water. If the the two ideas or images are placed side by side, we would have to say that – from an archetypal point of view – the same or similar qualities and expressions of Being are being represented. In one of Venus’s guises, she is Sophia who when emerging from the shell, is pure, chaste, refined, and an embodiment of beauty, Kwan Yin represents the same qualities of purity, chastity, beauty. Both perceive existence as beautiful, and their gaze upon things makes its innate essence shine forth. Another similarity in some of the imagery of Venus-Sophia and Kwan Yin, is Venus stepping out of or off of the shell on the ocean from which she was born and that of Kwan Yin with her foot extended to the earth from the lotus she sits in. In the Hindu and Buddhist traditions, when a deity has one foot extended toward or on the ground this represents stepping into a materialized life, in other words, incarnation. 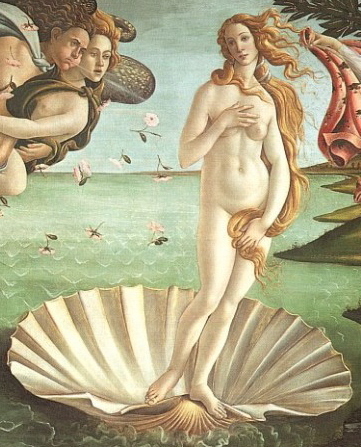 Similarly so, when Venus-Sophia stepped off her shell, she stepped out of the realms of pure beauty (Buddhist: Samboghakaya, Sanskrit: devachan) and into the realms of incarnated life. Doing so both would bring their skills of refinement and creative expression into the material worlds. Throughout human myths, symbols, teaching, and presentations there are many other examples of similarity of teaching. Regarding Kwan Yin, the object of this Generation Stage meditation, most often she is understood an emanation of Avolokiteshvara or embodiment of that essence of Being. Avolokiteshvara can be presented in either a masculine and feminine form, thereby representing that pure Being and its qualities is genderless and that all beings are, at essence, the same qualities of pure Being. As human beings, we are the full range of divine qualities within us that are pure Awareness, pure Presence, pure Creative Manifesting Ability, all of which are expressions of Ultimate Compassion and Wisdom. As such, it is illumining to understand that an image from any culture could be highlighting or representing qualities that are equally presented in another culture or form. The teachings across the world and across time are fundamentally similar because they are all pointing us to our inner nature and the full range of that, and that when we live from that then the beauty of manifest existence unfolds (like the lotus). This post is shared from The Practice of Living Awareness blog. This entry was posted in Astrology, Esoteric psychology and tagged Kwan Yin, Sophia, Venus. Bookmark the permalink.